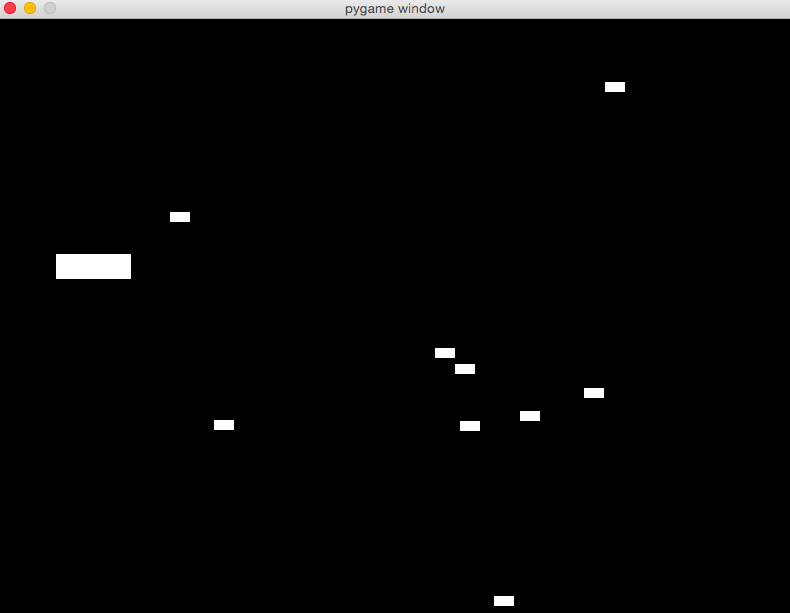 PyGame is a Python wrapper for the SDL library. SDL is a cross-platform library for accessing computer multimedia hardware components (sound, video, input, etc.). SDL is an extremely powerful tool for building all kinds of things, but it’s written in C, and C is hard, so we use PyGame. In this tutorial we’ll go over the basic PyGame logic and collision detection as well as drawing to the screen and loading outside files into our game. NOTE: This tutorial assumes you have a basic understanding of the Python syntax, file structure, and OOP. Navigate to the PyGame download page, and find the proper binary package for your operating system and version of Python. If you’re using Python 3, make sure you download version 1.9.2. As with all Python programs, we begin by importing the modules we want to use. 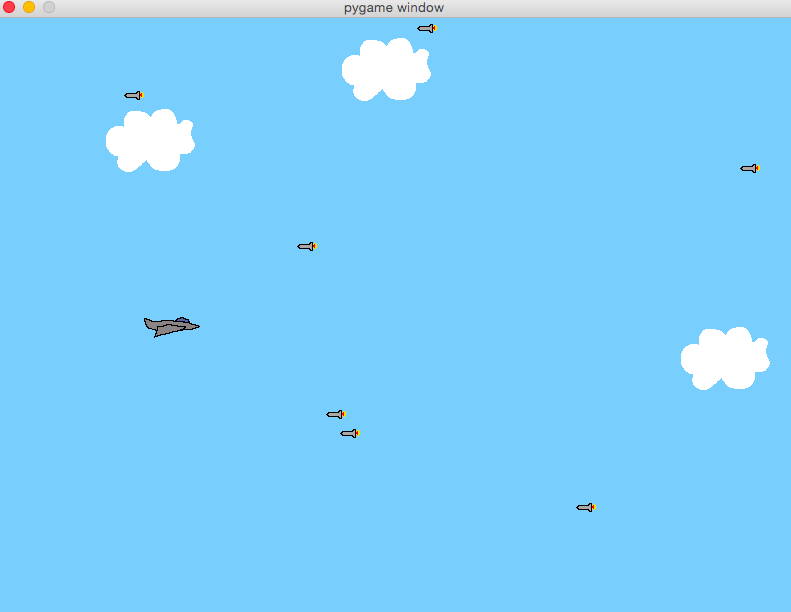 In this case we will be importing pygame itself and pygame.locals, which we will use later for some of the constants. The last line initializes all the PyGame modules, it must be called before you do anything else with PyGame. If you run this now you’ll see our window pop up briefly and then immediately disappear as the program exits. Not very impressive, is it? In the next section we will introduce our main game loop to ensure that our program only exits when we give it the correct input. Add these lines to the previous code and run it. You should see an empty window. It wont go away until you press the Esc key or trigger a QUIT event by closing the window. Surfaces and Rects are basic building blocks in PyGame. Think of surfaces as a blank sheet of paper that you can draw whatever you want onto. Our screen object is also a Surface. They can hold images as well. Rects are a representation of a rectangular area that your Surface encompasses. # This line says "Draw surf onto screen at coordinates x:400, y:300"
blit() takes two arguments: The Surface to draw and the location to draw it at on the source Surface. Here we use the exact center of the screen, but when you run the code you’ll notice our surf does not end up centered on the screen. This is because blit() will draw surf starting at the top left position. Notice the call to pygame.display.flip() after our Blit. Flip will update the entire screen with everything that has been drawn since the last flip. Without a call to flip(), nothing will show. What do you think would happen if you changed screen.blit(player.surf,(400,300)) to screen.blit(player.surf, player.rect)? Once changed, try printing player.rect to the console. The first two attributes of the rect() are x, y coordinates of the top left corner of the rect(). When you pass Blit a Rect, it will use those coordinates to draw the surface. We will use this later to make our player move! Here’s where the fun starts! Let’s make our player controllable. We discussed earlier that the keydown event pygame.event.get() pulls the latest event off the top of the event stack. Well, Pygame has another event method called pygame.event.get_pressed(). The get_pressed() method returns a dictionary with all the keydown events in the queue. We will put this in our main loop so we get the keys at every frame. K_UP, K_DOWN, K_LEFT, and K_RIGHT correspond to the arrow keys on the keyboard. So we check that key, and if it’s set to True, then we move our rect() in the relevant direction. Rects have two built-in methods for moving; here we use “move in place” - move_ip() - because we want to move the existing Rect without making a copy. Here instead of using a move method, we just alter the corresponding coordinates for top, bottom, left, or right. Now let’s add some enemies! There are a couple differences here that we should talk about. First off, when we call get_rect() on our surface, we are setting the center property x coordinate to 820, and our y coordinate to a random number generated by random.randint(). Random is a python library that we will import at the beginning of our file in the complete code (import random). Why the random number? Simple: We want our incoming enemies to start past the right side of the screen (820), at a random place (0-600). We also use random to set a speed property for the enemies. This way we will have some enemies that are fast and some that are slow. Our update() method for the enemies takes no arguments (we don’t care about input for enemies) and simply moves the enemy toward the left side of the screen at a rate of speed. And the last if statement in the update method tests to see if the enemy has gone past the left side of the screen with the right side of its rectangle (so that they don’t just disappear as soon as they touch the side of the screen). When they pass the side of the screen we call Sprites’ built-in kill() method to delete them from their sprite group thereby preventing them from being rendered. Kill does not release the memory taken by the enemy and relies on you no longer having a reference to it so the Python garbage collector will take care of it. Another super useful object that PyGame provides are Sprite groups. They are exactly what they sound like - Groups of Sprites. So why do we use Sprite Groups instead of a list? Well, sprite groups have several methods built into them that will help us later with collisions and updating. Let’s make a Group right now that will hold all the Sprites in our game. After we create it, we will add the Player to the Group since that’s our only Sprite so far. We can create another group for enemies as well. When we call a Sprite’s kill() method, the sprite will be removed from all groups that it is a part of. Now that we have this all_sprites group, let’s change how we are rendering our objects so that we render all objects in this group. Now anything we put into all_sprites will be rendered. That’s it! Now we have an event called ADDENEMY that we can listen for in our main loop. The only gotcha to keep in mind here is that we need our custom event to have a unique value that is greater than the value of USEREVENT. That’s why we set our new event to equal USEREVENT + 1. One small note for anyone curious about about these events: They are at their core just integer constants. USEREVENT has a numeric value and any custom event we create needs to be an integer value that is greater than USEREVENT (because all the values less than USEREVENT are already taken by built-ins). Now that we’ve defined our event, we need to insert it into the event queue. Since we need to keep creating them over the course of the game, we will set a timer. To do this we use PyGame’s time() object. Keep in mind that set_timer() is exclusively used for inserting events into the PyGame event queue - it doesn’t do anything else. Now we are listening for our ADDENEMY event, and when it fires, we create a new instance of the Enemy class. Then we add that instance to the enemies Sprite Group (which we will later use to test for collision) and to the all_sprites Group (so that it gets rendered along with everything else). # import random for random numbers! # Create a custom event for adding a new enemy. Now we have a game, but kind of an ugly game. Next we will replace all the boring white rectangles with cool images that will make the game feel like an actual game. In the previous code examples we used a Surface object filled with a color to represent everything in our game. While this is a good way to get a handle on what a surface is and how they work, it makes for an ugly game. We’re going to add some pictures for the enemies and the player. I like to draw my own images, so I made a little jet for the player and some missiles for the enemies, which you can download from the repo. You’re welcome to use my art, draw your own, or download some free game art assets to use. We want to replace our Surface object with an image. 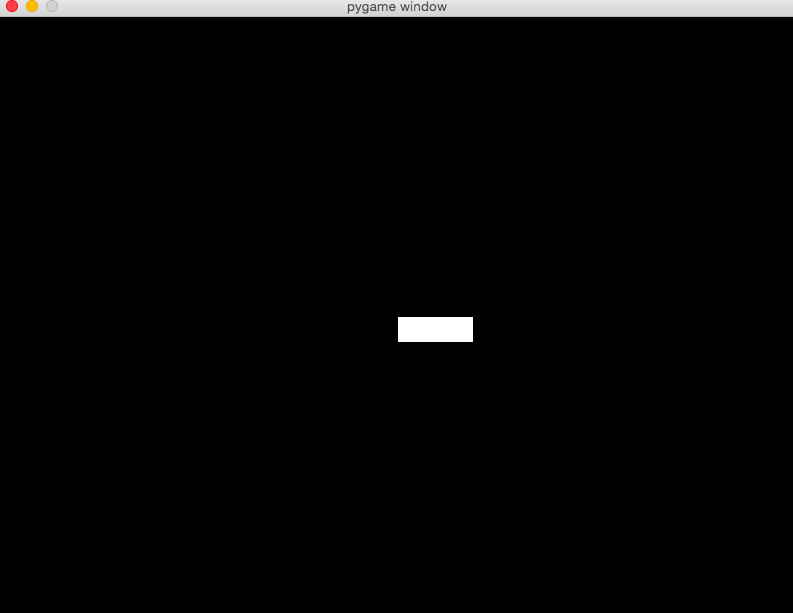 We will use pygame.image.load() by passing it a path to a file. The load() method will actually return a Surface object. We then call convert() on that Surface object to create a copy that will draw more quickly on the screen. Next we call the set_colorkey() method on our image. The set_colorkey method sets the color in the image that PyGame will render as transparent. In this case I chose white, because that’s the background of my jet image. RLEACCEL is a optional parameter that will help PyGame render faster on non-accelerated displays. Lastly, we get our rect object in the same way as before: By calling get_rect() on our image. Remember the image is still a surface object; it now just has a picture painted on it. Now in our main game loop, where we step through our event queue, we need to start listening for our ADDCLOUD event. We’re going to add the clouds to the all_sprites Group as well as the new clouds Group. We add them to both because we’re using all_sprites to render and clouds to call their update function. You might ask why we don’t add them to the existing enemies Group; after all, we’re calling nearly identical update functions on them. The reason is, we don’t want to test the player for collisions with the clouds. Our jet needs to pass cleanly through all the clouds. Now all that’s left is calling our clouds Group update() method. The complete code is available on the GitHub repo. I hope you enjoyed the tutorial and found it helpful.